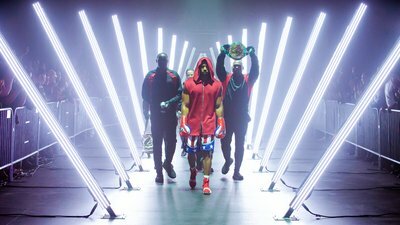 With "Creed II" set to hit theaters, Michael B. Jordan's trainer, Corey Calliet, tells us what it takes to build a Rocky-worthy physique, what Stallone himself thought of his work, and the long road he travelled to become Hollywood's go-to trainer. Your hands are taped tight and your arms, slick with sweat, knife through the air. Your shirt is off. Your feet shuffle. Your shoulders are pistons, pumping your jabs and hooks and uppercuts through the empty space in front of you. All around you jump ropes skip and heavy bags thud and speed bags patter. The humidity in the boxing gym is insufferable. You're deep into the mental game now. To push yourself, you think of your favorite boxers and your favorite boxing movies and your thoughts drift to Rocky II. In your mind, maybe you're the Master of Disaster and the King of Sting himself, Apollo Creed. Maybe you've retired more men than social security. And maybe one day you'll have the body of an NFL linebacker and go the distance with your own Rocky Balboa. For eight years, this was how Corey Calliet lived and trained: as a boxer. But then, like many former fighters, he found himself drawn to the project of building bodies, not just bludgeoning them. He trained and competed as a bodybuilder, and built a new reputation as a trainer who was uniquely talented at molding his own body—and those of his clients—into specimens of athleticism. But even as a bodybuilder, Calliet retained the focus and minimalist mindset of a boxer. That's how he found himself training one of his clients, an aspiring actor, in a studio-sized gym in an apartment in Baton Rouge, Louisiana. That client could hardly lift a weight when they started working together. With the bare minimum of equipment—some dumbbells, a universal machine, a few kettlebells—he began to craft that actor's physique. No high-tech anti-gravity treadmills or spin bikes. Just the iron and an iron will to transform another man into the best physical version of himself. Then that actor got a call. He'd landed the role of a lifetime. The client was Michael B. Jordan. The role was Adonis Creed. Corey Calliet was going to be training Apollo Creed's son off the screen, so Rocky Balboa can train him on it. Suddenly, it all came together. Calliet had the perfect background, with the perfect client, playing a legendary character. Time to deliver. Where to begin when building the son? Look at the father. In this case, that would be Carl Weathers, who played Apollo Creed. Weathers built his physical foundation as a collegiate and pro football player in the late 1960s and early 70s, and by the time he co-starred in "Rocky," "Rocky II," and "Predator," he had dialed in a lean, hard-as-steel physique that looked imposing even when paired with the likes of Sylvester Stallone and Arnold Schwarzenegger. "I began studying Apollo's physique when we did the first 'Creed,'" Calliet tells me. "We were working on "Fantastic Four," and Michael told me we were going to do the movie. My goal was to get him as aesthetically close to Apollo Creed as possible. He had to have good shoulders, good abs, and he had to have a lot of the detail in Apollo's back, because they film the fights so much from behind." Here, in the drawing board phase of physique building, is where Calliet's experience as a bodybuilder paid off. He wasn't content to simply make Jordan look like a boxer. He wanted his physical presence to pop off the screen and awe viewers. "I believe bodybuilders have the most perfect physiques when it comes to aesthetics," he said. "It's a movie, so you can't see the conditioning we put in ahead of time. But you can see the conditioning through Michael's body. Every day we were thinking about it. We knew what we wanted the finished product to look like." Five minutes into "Creed" and it was apparent to audiences nationwide that Calliet and Jordan had succeeded. In one of the first scenes in the movie, Jordan's character, Adonis, is watching film of his father fighting Rocky while shadowboxing in front of the video. From the style to the body outline to the movement, the resemblance to Apollo was eerie. If you didn't know any better, you might think that Jordan was actually Carl Weathers' son. For "Creed II," the plan Calliet hatched for Jordan's physique was simple. "We wanted to beat every other movie we've ever done," Calliet said. "Michael got big for "Black Panther," and we wanted to add more mass for "Creed II." I knew I could bring in a bigger body, and he's actually larger with more rounded muscle in this movie." They had four months to train, from January to June. During the game-planning phase, Calliet says, he doesn't map out a graph of numbers that he and his client must follow during training. He goes by look and feel. "Numbers don't mean anything to me," he said. "I'm not one to worry about someone getting to 6 percent body fat or anything like that. I go by what the mirror tells me. We wanted Michael to have full muscle bellies, while looking defined." In the beginning, since Jordan hadn't been in the ring recently, they stuck with straight boxing workouts to bring his conditioning back where it needed to be. Then they moved on to plyometrics and weight training. The workouts toward the start of filming involved a lot of supersets and compound movements. They'd go from bench press into a barbell curl into bodyweight squats, with the weight and intensity increasing along the way. A quick peak into Calliet's Instagram timeline provides a nice glimpse of what the training was like, with Jordan grimacing against the iron while Calliet pushes him to go harder. There was no time to rest. The bar was set too high. If the goal for the first "Creed" was to match Apollo's physique, the goal for the sequel was a bit more ambitious: to land somewhere between Apollo and what Sylvester Stallone looked like in Rocky III. "I liked how Rocky looked in the third movie the best. I thought if we could get Michael into this movie somewhere in the middle of Rocky and Apollo it would work," Calliet says. "As a trainer, as an artist, I want to have the best-looking body on screen. You have never seen a body like Michael has in this movie. When you're sitting at 190 pounds, and you look ripped like that." While Calliet will have to wait until the movie hits theaters to find out if audiences agree with the finished product, he's already received the highest form of praise he ever could from the man who matters most. "I play a corner man in the movie, so I was on set and the first day Sly was on set. He came up to me and said, 'Hey Corey, Michael looks great'," Calliet says. "I was like… Did Rocky just say my name?" The two became friendly and connected over boxing and training throughout the making of the movie, but Sly saved his highest praise for the last day of filming. "On the final day of the shoot, Sly came over to me and said, 'Corey, you are an artist. Exactly as Michelangelo sculpted David, you sculpted Michael B. Jordan.'" That's a comment that makes both the boxer and the bodybuilder inside of Calliet feel like champions. "Creed II" Hits Theaters November 21, 2018. Jon Finkel is an award-winning author, as well as an avid speaker, writer, and creative strategist for brands in sports and health.